John MILLARD Sr. (1608 -1689) was Alex’s 11th Great Grandfather, one of 4,096 in this generation of the Shaw line. John Millard Sr. was born 1608 in St. Chad’s, Cheshire, England. His parents were Robert MILLARD and Elizabeth SABIN. He married our ancestor in England, but her name has been lost to time. He married Elizabeth Baugh in 1653 in Rehoboth, Mass. John died in 1689 in Rehoboth, Bristol, Massachusetts. 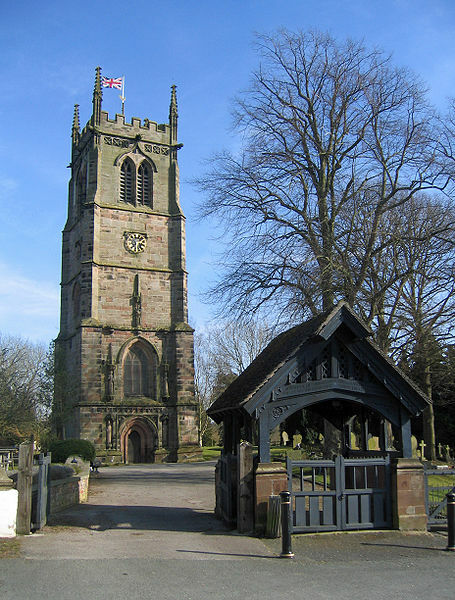 St Chad’s Church, Wybunbury was an Anglican church in the village of Wybunbury, Cheshire, England. The body of the church has been demolished but the tower still stands. Elizabeth Baugh was born 1612 in St. Chaddis, England. Her parents were Charles Baugh and Joan [__?__]. Elizabeth died April 18, 1680 in Rehoboth, Bristol, Massachusetts. Evidence regarding the two marriages of John Millard Sr. is inextricably entangled with the data regarding his children. No records have been found of the identity of his first wife, or the date and place of the marriage. As a matter of face, the multiplicity of John Millards, father, son and grandson, in the early records of Rehoboth has raised some doubts as to whether the Elizabeth who died in 1680 was really the spouse of John Sr. at all; John Jr. also had a wife Elizabeth. (Giddings, p. 248) Happily this question is now settled. In a deed of 4 Mar 1679/80, John MILLER Sr. of Rehoboth, tanner, conveyed to his son Samuel Miller his house and home lot, salt marsh in the Hundred Acres, likewise fifty pounds of commonage in Rehoboth, the son Samuel to fully possess all “except if my beloved wife Elizabeth doeth outlive me”; then was to have one half the house, orchard and lands during her natural life, and after her death Samuel to have all. Witnesses: John MILLER Jr. and the mark of Hannah Miller. (Plymouth colony Deeds Vol. 4, p. 354; Bowen, Vol. III, p. 163) This instrument was acknowledged by John Millard Sr. on 12 Apr 1680, just six days before Elizabeth’s burial. 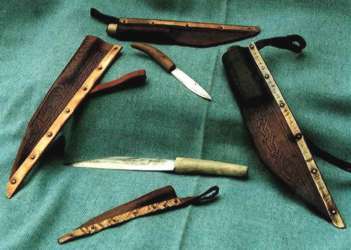 England Elizabeth [__?__] 5 Jun 1684 Rehoboth, Mass, of two self inflicted dagger wounds in the neck. On 30 June 1684, John Miller of Rehoboth, tanner, “for good grounds moving me thereunto and out of love and affection to my son Robert Miller of Rehoboth, Tanner, have many hears since given, granted, allined … and by these presents give, grant, alien and assign forever to said Robert Miller, his heirs and assigns .. as his and their rightful inheritance. To be holden after ye maner of East Greenwich in ye County of Kent in England”; fifty pounds commonage in Rehoboth, nine acres, “part of it being a part of his homestead”, two divisions of upland, “laid out since this gift, one being in he two thousand acre Division”, ten acres at Chestnut Hill, and eight acres at Wachamokett Neck. Witnesses: Samuel Miller, William Carpenter. (Plymouth Colony Deeds, Vol. 5, Pt. 2 p. 278). In this and other deeds of the period, the expression, “To be holden after ye maner of East Greenwiche in ye County of Kent in England” was a legal cliche referring to the fact that such lands were grants from the Crown. The same wording, derived from the fact that a royal residence was located for many years at East Greenwich (now a part of London), occurs in a number of the early colonial charters. There is no implication that either the grantor or the notary who drew up the deed had any personal acquaintance with East Greenwich. The evidence that John Millard Jr. was a son of John Sr. is less clear cut than in the case of Robert but circumstantially impressive nevertheless. The date of the conveyance just quoted from John Miller of Rehoboth to his son Robert is significant in this connection; it was drawn up ten days after the inventory of John Jr. Presumably John Sr. had given each of these sons his inheritance “many years since”, but no formal deeds of gifts had been recorded. Perhaps this omission had proved a hindrance in the appraisal of John Jr’s estate; so the father then hastened to confirm his gift to the surviving son by his first wife. Further indications that John Jr. was in fact a son of John Sr. are found in the following data: from 1657 until 1684 the two Johns were always designated as Senior and Junior; whereas earlier while the younger John was still a minor and later after John Jr.’s death, the older man was listed simply as John Miller. In 1680 John Miller Jr. was a witness, with John Sr.’s daughter Hannah Miller, in the deed of inheritance from John Sr. to his son Samuel. It was not unusual for other heirs to witness such deeds of gifts, as instanced by Samuel’s signature as a witness to the 1684 conveyance from John to his son Robert. However, with Robert and John Jr. now established as sons of John Millard Sr., another problem arises. It seems very unlikely that the wife Elizabeth whose son Benjamin was born in 1662 was also the mother of Robert born thirty years earlier. To avoid this physiological anomaly, to explain more logically the great disparity between the ages of the two older sons and John’s later children, and to account for the very considerable hiatus between John’s known arrival in Rehoboth and the birthdates of his recorded children, the following hypothesis is formulated: John Millard, with a wife and family including two small sons, probably came to New England about 1637 at the same time as his kinsman who settled in Boston. By 1643 John was established in Rehoboth, but he was then probably a widower since he had no children recorded during his early years in the town. About 1652 he married Elizabeth who died in 1680. It is true no direct evidence has been found to support this theory; perhaps none can ever be discovered. But conversely, there is no evidence to discourage, and considerable logic to support, the contention that John Sr. must have had two wives. At a hearing in Suffolk County Probate Court, on 4 Feb. 1669/70, several friends and neighbors of the deceased Thomas Millard testified as to his wishes regarding his estate: “He would give… his land at Centry Hill … to his kinsman at Seaconk who hath many children”; “he would give his estate to his cousin Millard because he was brought up at his father’s house”; “he intended cousin Miller should have good part of his estate … because ‘I have no other kindred in the country nor certainly do know that any other is alive'”. The estate referred to in this testimony consisted principally of two lots in Boston. One of these, described in the inventory as “a small parcel of land lying on the side of Century Hill and fronting the Common”, was in fact almost the whole of the lot upon which the State House now stands, a half acre of which was Millard’s by allotment and an additional acre brought of Zaccheus Bosworth in 1651. (Report of the Boston Record Commissioners, Vol. V. pp. 116-117) Thomas also owned a half-acre lot near the South Meeting House, in connection with which property the Administrators of his estate were sued by Gamaliel Waite. At a court hearing, on 25 Feb 1671/72, Waite, an abutting property owner, claimed that Millard in replacing the fence around his lot had included land which belonged to Waite’s lot and that the land so appropriated was now included in the inventory of Millard’s estate. (Supreme Judicial Court of Suffolk County, Mass., Case #1092). Robert’s wife Elizabeth Sabin was born about1640 in Titchfield, Hampshire, England. Her parents were William Sabin and Mary Elizabeth Wright. After Robert died, she married 12 Jan 1700/01 to Samuel Hayward (b. 1646; d 29 Jul 1713. Mendon, Mass). He first married Mehitable Thompson. Elizabeth died 7 Feb 1716 in Rehoboth, Bristol, Mass and was buried at Newman Ch Cem, Seekonk, Bristol, Mass. Like his father Robert Millard was a tanner at Rehoboth. In 1668 he was one of those who received lots in the North Purchase meadow (later Attleboro); and in 1689 he was listed among the Inhabitants and Proprietors of Rehoboth. In addition to the lands he had by propriety, Robert bought lands at Palmer River from Anthony Perry, John Fitch and Joseph Peck and salt marsh in Swansea from Peter Hunt. His name is included in various Rehoboth tax lists from 1671 to 1678, and on 26 Jan 1676/77, “An account of the charges that several Persons have been at relating to the late War” (King Philip’s War) shows “Rob Miller — b. 5.17.06”. The Massachusetts towns were then required to equip and provision their own militiamen, and the money listed in this account was probably used for this purpose. Besides this financial contribution to the war effort, Robert Millard served at the Turner’s Falls Fight (See my post) under Capt. William Turner. Although Robert remained throughout his life a resident of Rehoboth, on 19 May 1685 he owned land in New Meadow Neck in Swansea (between Runen’s River and Warren River) and was listed as one of the proprietors of Swansea (between Runen’s River and Warren River) and which is now Barrington and Warren, R.I. including parts of Swansea, Seekonk and East Providence. Similarly the name of Robert Millard was listed on 23 July 1689 among “the several persons that live … (torn) …” in Swansea. New Meadow Neck was part of Swansea from the organization of that town in 1663 until it was set off to Barrington in 1717. The will of Robert Millard of Rehoboth, Tanner, dated 11 Mar 1698/99, proved 29 March 1699, bequeathed to sons Solomon and Ephraim, dwelling house, barn and lands belonging thereto, upland at Palmer River, and fifty pounds commonage; to son Nathaniel, ten acres on Rocky River; to son Nehemiah, fifty acres “he now lives upon”; to son Robert, fifty acres at the northside of Rehoboth. To each son he gave in addition a piece of salt meadow in New Meadow. He bequeathed further to his grandsons, John and Richard Bragg, fifty acres of the northside to each; to daughter Elizabeth, a cow; to daughters Mary and Experience, ten pounds each; and to wife Elizabeth, all household goods, living space and her maintenance at the expense of the sons Solomon and Ephraim, who were designated executors. Witnesses: Timothy Blake, Thomas Bowen. The inventory, totalling £271.10.00, included besides the real estate listed in the will, Barks Mill and Tann Pitts (this mill was evidently used to grind bark for use in tanning), stock in the Tann Pitts, Raw hides and Barks, ten acres at Chestnut Hill, a 14 acre lot lying by William Doans, and ten pounds worth of smithy tools. On 17 June 1695, Robert Millerd had deeded to his son Nathaniel Millerd of Rehoboth, Malster, one half acre on the east side of Palmer River, previously purchased of John Fitch. Then on 29 March 1699, Mary Millerd, one of the witnesses to the deed, and on 18 May 1699 Henry West, the other witness, swore that they had seen Robert sign. The record of their testimony provides further confirmation of the date of Robert’s death. Hannah’s husband Daniel Thurston was born 6 May 1646 at Dedham, Mass. His parents were John Thurston and Margaret Buck. He first married 1 Apr 1674 in Cambridge, Middlesex, Mass to Mary Stedman (b. 27 Apr 1645 in Cambridge, Mass. – d. 21 May 1680 in Medfield, Mass.) Daniel died 23 July 1683 at Rehoboth. Hannah’s second husband Silas Titus was born 18 May 1656 in Rehoboth. His parents were our ancestors John TITUS and Abigail CARPENTER. Two children. After Hannah died, Silas married again 23 Oct. 1679 to Sarah Battelle of Dedham, who d. 8 Apr 1689. He married a third time 24 Jan 1716/17 at Rehoboth to Mehitable Ormsbee. Mehitable was previously married to Joshua Ormsby, son of our ancestor John ORMSBY Sr. Silas died in 1741. Samuel’s first wife Esther Bowen was born 20 Apr 1660 in Rehoboth, Mass. Her parents were Richard Bowen Jr. and Esther Sutton. Esther died 12 Apr 1699 in Rehoboth. Samuel’s second wife Esther Jenckes was born 1664 in Pawtucket, Providence, Rhode Island. Her parents were Joseph Jenckes Jr. and Esther Ballard. Esther died 29 Jul 1721 in Rehoboth, Mass. Because the will of Joseph Jenckes Jr., dated 21 Oct 1708 does not name any of his daughters, Esther’s marriage has been omitted from The Jenks Family in America, 1952, by William B. Browne (p. 3). Her identity as stated above is based on the Genealogical Dictionary of Rhode Island, 1887, by John O. Austin (p. 113) and the Ballard Genealogy, 1911 by Charles Frederic Farlow (p. 17). In this connection it is interesting to note that Esther (Jenckes) Millard’s only son was named Joseph, perhaps after his grandfather. The Joseph Millard listed on 7 Feb. 1689 among the Inhabitants and Proprietors of Rehoboth was certainly this son of John Sr., but there is little data to indicate what became of him after that date. Possibly he was the Joseph Millard who is shown in the published church records of Windham, Conn. as a communicant sometime later than 1700 but earlier than 1726, when his brother Benjamin Millard and wife Lydia were listed as members of this same congregation. However, there are no vital statistics, deeds or probates recorded in Windham for this Joseph Millard. The evidence to date suggests the possibility that both Joseph and Benjamin moved to Connecticut, but Joseph died or was killed there, before he had children of his own; whereupon Benjamin named his only son for his deceased brother. Benjamin’s wife Lydia Reynolds, was born February 1671. Her parents were John Reynolds and Sarah Backus. Lydia died at Windham, 7 Jan. 1756, age 84 years. Following the Norwich, CT marriage record of this couple, which shows the groom as “Benjamine Miller”, the History and Descendants of John and Sarah (Backus) Reynolds of Saybrook, Lyme and Norwich, Conn., 1928, by Marion H. Reynolds (p. 13) surmises that Lydia’s husband was “possibly a son of George Miler of New London”. But the Windham, Conn. church records consistently show the surname as “Millard”; early town records and deeds concur; and Benjamin’s will shows the spelling “Milard”. With the coincidence of a Benjamin Millard who arrived in Norwich before 1693 as an unattached young man and the disappearance from Rehoboth, Mass. After 1689 of a man of identical name who was then 27 years old, Giddings was led to the reasonable conclusion that Benjamin of Windham was truly the son of John Sr. of Rehoboth. (Giddings, p. 248) The proof of this proposition is still circumstantial, but there is no contrary evidence. On 7 Feb 1689, Benjamin Millerd was listed among the Inhabitants and Proprietors of Rehoboth, but this is his last appearance in the records of that area. Soon thereafter he moved to Norwich, Conn. and then to Windham, where in 1694 “Benjamin Millard of Bear Hill, Norwich” bought from Thomas Leffingwell a thousand acre allotment at the “Horseshoe”, a bend in the river near the center of the town. In 1698 Benjamin was chosen “hayward for fields at the Crotch of the River”, and in 1700 he was allowed “to set up the trade and employment of tanning” — an occupation which he had perhaps learned from his father and brother Robert in Rehoboth. In a list of 5 March 1718, Benjamin Miller was among the forty-five persons admitted as proprietors of the neighboring town of Ashford, Conn., where Benjamin’s nephew, Nathaniel Millard #8, was later to appear as a large landowner. Both Benjamin and his wife Lydia (called “Lucy” in the Windham history) were listed in 1726 as church members in Windham. 28 Nov 1706 – Benjamin Millard bought 102 acres in the 600 acre lot in Windham. 18 Nov 1736 – He sold 12 acres on the west side of Chestnut Hill “ in the southwest part of my 50 acre lot”. 5 May 1743 – Benjamin Millard (his mark) of Windham, for kindness and services performed by “my daughter Sarah Miller ever since she arrived at the age of 18 years” and also for fatherly love and affection, gave her one-half his dwelling house and one-half of the 30 acres on which the house stood, reserving a place therein to “myself and wife during our natural lives and the life of the longest liver of us”. 16 Dec 1751 – Sarah Millard of Windham deeded to John Marcy of Woodstock (whom she married the following day) all my land and buildings in Windham, being one-half of the dwelling house that lately belonged to my father Benjamin Millard deceased and one-half at 30 acres of land, reserving the use and improvement of same to my mother Lydia Miller during her life. 5 June 1756 – After his own marriage and his mother’s death, Joseph Millard sold to John Marcy of Woodstock (his sister Sarah’s husband) 25 acres in Windham with a “mantion house”, being the homestead that belonged “to my Honrd Father, Mr. Benjamin Millard late of Windham deceased”. Sarah already owned one half of the homestead by deed of gift, and title to the remaining half had come to Joseph as part of the “residue” of his father’s estate. On 9 June 1756, John Martin and Mary Parker and Stephen Parker, all of Windham, quitclaimed to John Marcy of Woodstock all their rights in 225 to 30 acres in Windham “that belonged to my honored Father Benjamin Millard late of Windham deceased”. This John and Mary, nee Martin, were presumably the mentioned but unnamed “children of daughter Mary deceased” who appear in Benjamin Millard’s will, and the deed should have read “our …grandfather Benjamin Millard”. This entry was posted in 13th Generation, Historical Church, Immigrant - England, Line - Shaw, Public Office and tagged Rehoboth, Tanner. Bookmark the permalink.